Built in Finland as a six star vessel, this ship started life in 1972 as the Viking Star, and was regarded as one of the most luxurious cruise ships in the world at the time. After two more brief acquisitions by other cruise lines, she was bought by Fred. Olsen in 1996 and renamed the Black Watch. In common with the rest of the Olsen fleet, it has a devoted following of regular cruisers. After its multi million pound refurbishment in November 2016, the Black Watch has an entirely new look. The public areas have been redesigned and refurbished with new layouts, furniture, carpets and curtains, and luxurious seating everywhere. The Morning Light Pub replaces the Braemar Lounge, covering a much larger area in common with the rest of the Olsen fleet. The former Morning Light Pub is now the Neptune Bar, and the former Braemar Courtyard is now a speciality dining area, with a fascinating and eclectic display of art chosen by Fred. Olsen. All 423 cabins across the ship have also been refurbished, and equipped with all the latest features, such as bedframes and mattresses, as well as very attractive new décor. 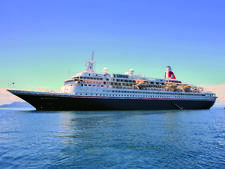 The Black Watch regularly welcomes special interest groups, and on our cruise of the Norwegian Fjords in June 2017 we had the Kirker Music Festival at Sea, with daily concerts by the Doric String Quartet and pianist Alasdair Beatson in the Marina Theatre for its members, and a special concert for everyone in the Neptune Lounge. To sum up, we would say that an old friend has been rejuvenated without losing any of its traditional qualities. 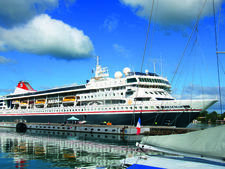 The ship attracts mostly mature British passengers, although children are welcome on most sailings and an activity programme is provided for them. 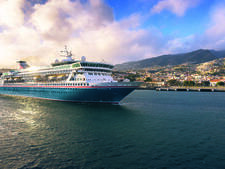 There were no children on our cruise, but a number of younger people were on board, attracted by the onshore activities such as cycling and walking. Everyone mixed well, creating a warm and friendly atmosphere. There are usually two formal nights and one themed night on a seven night cruise. Formal wear is defined as a dinner jacket or dark suit and tie for the men, and a cocktail or evening dress for the ladies. On the formal nights the majority of men were in dinner jackets and ladies in long dresses. Normal evening wear is defined as smart casual, open neck shirts with collars for gentlemen and casual separates or summer dresses for ladies. Our themed night was British, with quite a few passengers turning out in red, white and blue. Daytime wear is usually trousers or shorts and t-shirts. A gratuity of £5 per person per day is normally added to the bill, but this can be removed or adjusted through Guest Services. Currency used on board is pounds sterling.